Chickens aren’t exactly aerodynamic. At best, some of the petite and sleek bantams can fly well enough to get over a fence, and some of the heavier birds can flap enough to get up onto a low branch. 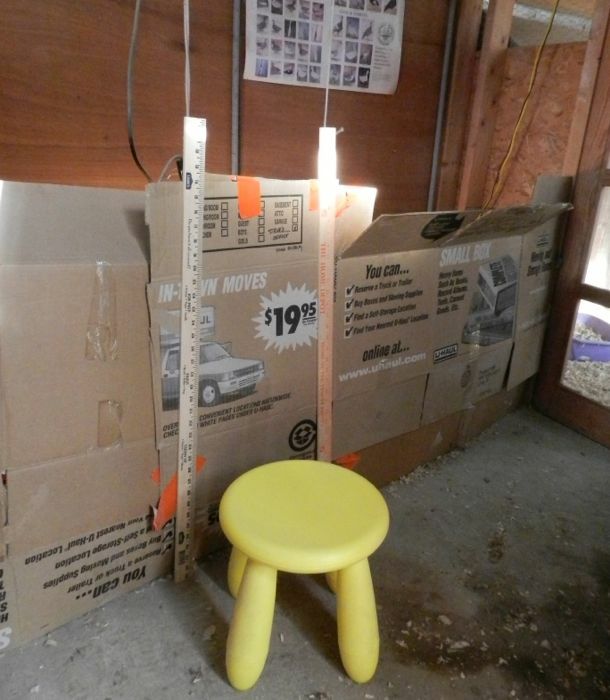 This doesn’t mean that your chickens should spend all of their time on the ground. Mature hens need to sleep on roosts for both health and comfort. Chickens poop a lot at night. 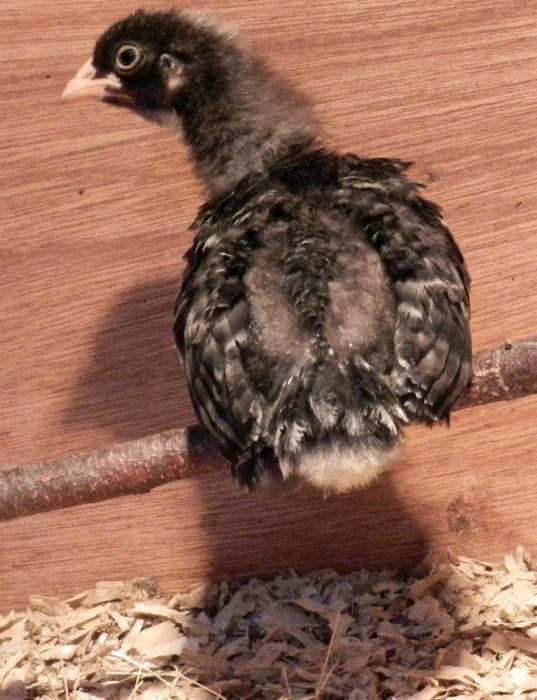 A chicken that is sleeping on the ground or in a nesting box is sitting on her own damp and ammonia-fumed waste. Roosts are also important for your flock’s social life. 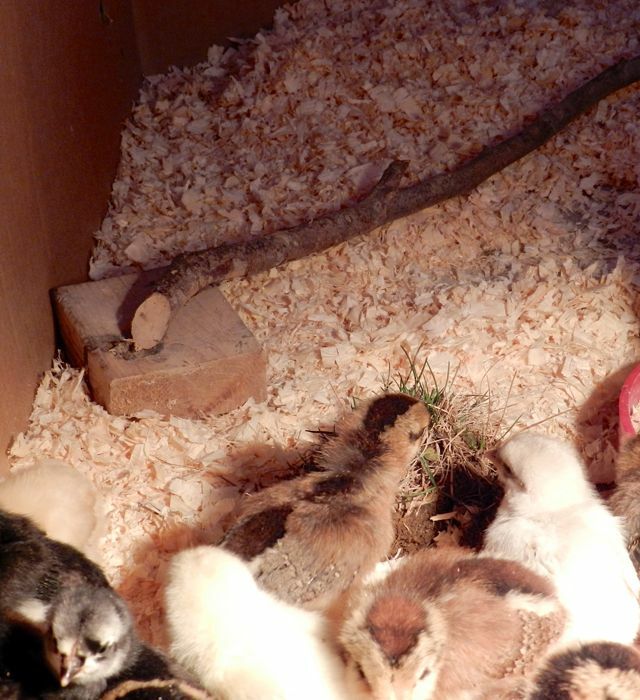 Chickens can sort out their affiliations during the evening jostling for a sleeping spot next to their friends. During the day hens that need to get away from the pecking order drama (like Siouxsie) can hop up onto a roost for some peace. All of these reasons for having roosts apply to your chicks, too. Although they innately know to roost, they do need a bit of practice and baby-sized roosts to get them started. 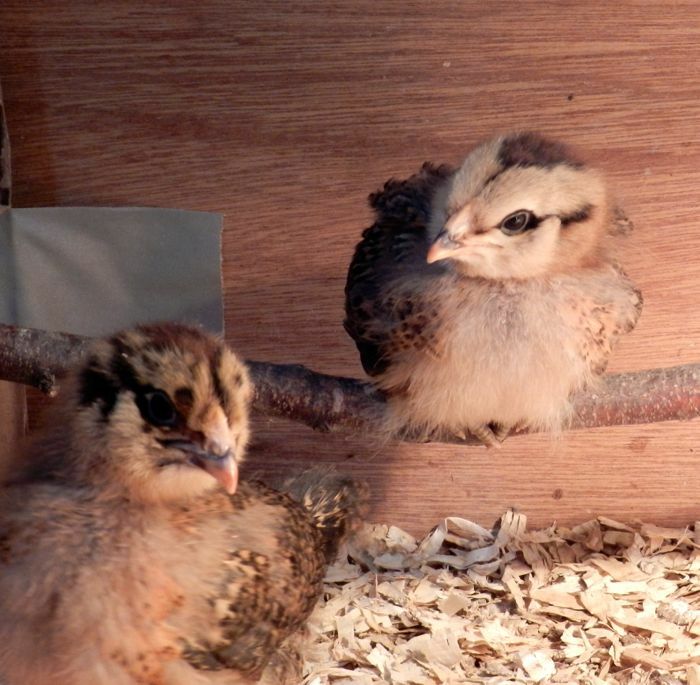 A piece of wood can be a balance beam for your chicks. Even better is a roost made from a branch nailed onto two pieces of scrap wood. 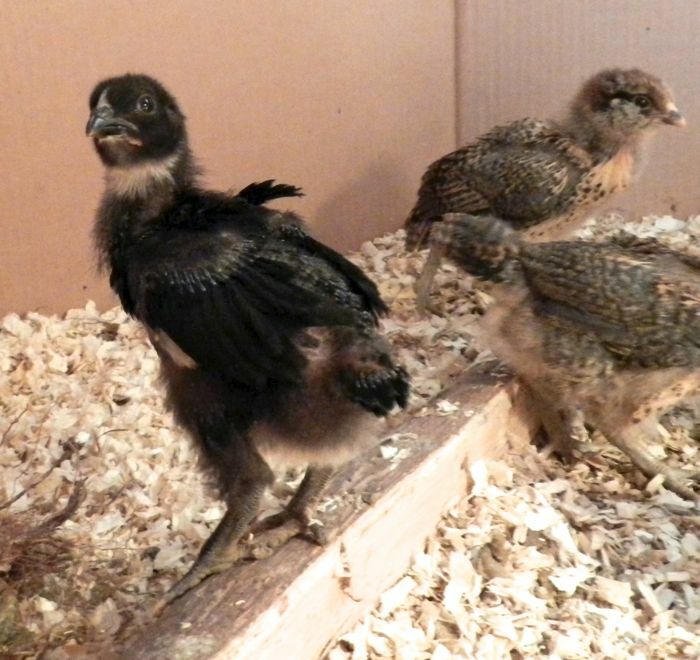 The first week I put this roost into the brooder. There was some worry about what it was, but soon the chicks were up, over, and perching. and were soon comfortable enough to bask in the heat lamp and get their fluffy little bottoms toasty warm from this perch. Meanwhile, the chicks are getting larger, growing long and sturdy feathers, and running, flapping, and getting lift-off. The sides of the brooder have been raised. Soon the chicks will outgrow this enclosure. Twenty six chicks take up a lot of space!. More changes are in store. I’ll fill you in later this week. It must be a trick to change their water and feed containers with the extended walls. do `you` have a perch? Very interesting and informative blog. Thank you! I like your roost, Terry! I let my hens hatch 5 of their own eggs a few years ago. I was shocked at how much faster the chicks learned than those I raised without a mama hen. They were flying over the cardboard walls at such a young age, it amazed me. 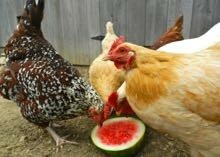 We had 2 “Sioxsie” chickens: Ike & Tina Turner & they would always try to spend their nights sleeping in a tree! At first, we thought they’d escaped our yard but once we found their favorite branches, we knew where to find them. Luckily they roosted low enough that we could reach them with a step stool. They’d look at us like “What are you doing up here & why do we have to move to the coop?” Too funny. The little chick facing front on the perch is so so cute! What a beautiful photo. I’m taking a zillion photos. Irresistible. I have four hens that will not roost at night, they always sleep fluffed up together on the floor of the coop, just as they have done since they came home. They DO roost outside of the coop during the day in the run, so I know they know how, but never at night in the coop. If that’s the case, there might be something about the inside roosts they don’t like. Also, if it’s dark inside by the time they go to bed, then they can’t get up to see the roosts. Have you tried lifting them onto the roosts every night for a few days?